Which one would you like in your backpack? NAMM 2016: When Korg released its first nanoSeries controllers in 2008 it pretty much created a new product category: the ultra-portable MIDI keyboard, drum pad and mixer. Since then, several other manufacturers have released rival hardware - and we've had the second-gen nanoSeries - but now Korg has upped the ante again with the announcement of the nanoKey Studio and nanoKontrol Studio, two battery-operated devices that can be used wirelessly. The nanoKey Studio gives you 25 pad-style keys that are velocity sensitive. They're also illuminated, which comes in handy when you engage the Scale Guide function. This lights up the 'recommended' notes of a scale, making it easier to play, while the Easy Scale feature enables you to produce musical phrases using any keys. Above the keyboard are eight velocity-sensitive trigger pads that are designed not only for recording drums, but also chords. The Chord Scale function automatically assigns the 'best' chords based on your selected key and scale, aiding composition. The nanoKey Studio also includes a KAOSS-style touchpad and eight assignable knobs. If the nanoKey Studio is designed for creating music then the nanoKontrol Studio is best suited to mixing it, offering eight channels of faders, knobs and buttons. There are also transport controls and a jog wheel. Both controllers are compatible with PC, Mac and iOS, and can be plugged in (via a USB cable) or used wirelessly via Bluetooth 4.0 (assuming your OS supports it). Each one also comes with a decent bundle of production software, plus a software editor and, in the case off the nanoKontrol Studio, a Control Surface plugin for GarageBand and Logic Pro X users. 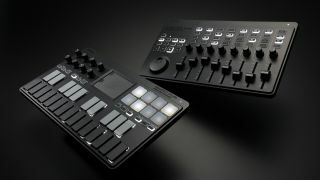 The nanoSeries Studio controllers will be priced at £130 each and will ship in April (nanoKontrol) and May (nanoKey). Find out more on the Korg website.